Tong Home / Inn - c. 1839 - Market Street. This was the first brick home built within the village. 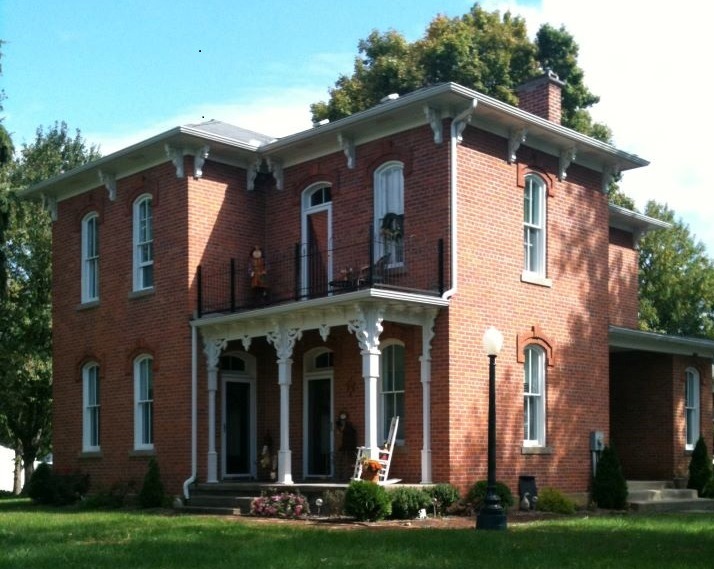 Historical information states this home was built around 1839 and once served as an inn / hotel (the second inn in the village). Initial lot ownership traces back to Oliver Tong and Wife (Lot 51) and Jackson H. Tong and Wife (Lot 52). It is undetermined exactly who built this home. 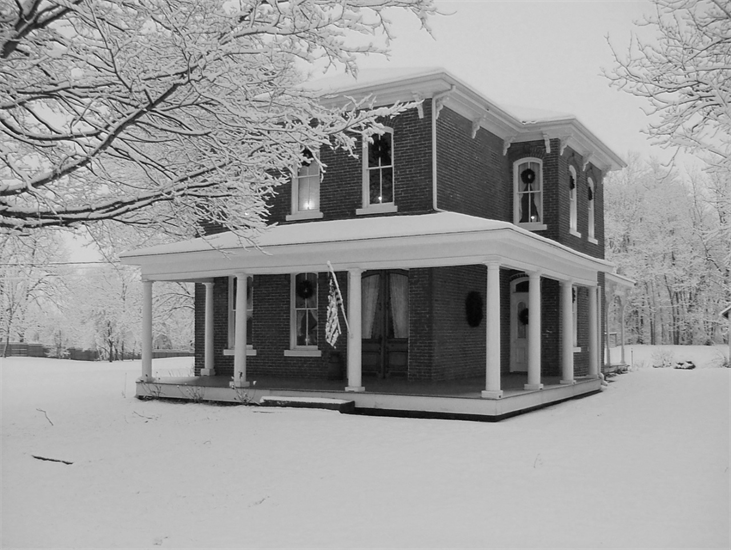 Jacob W. Fenstermaker (1822-1908) and his wife, Susannah, relocated with their 5 children from their farm* north of Carroll to this home around 1863. Known as Squire Fenstermaker, he served as Justice of the Peace and, in 1902, he was elected as Mayor of Carroll. The home remained in the Fenstermaker family for 120 years. Owners in more recent decades included Jennie Fenstermaker, Gertie and Edwin Schmidt, and the Hungerman Family. Since 1994, its current owners remain as Earl and Michelle Staffen. *Interesting Note: Fenstermaker's farm was later sold to the Jeffries Family, brithplace of prizefighter James J. Jeffries. 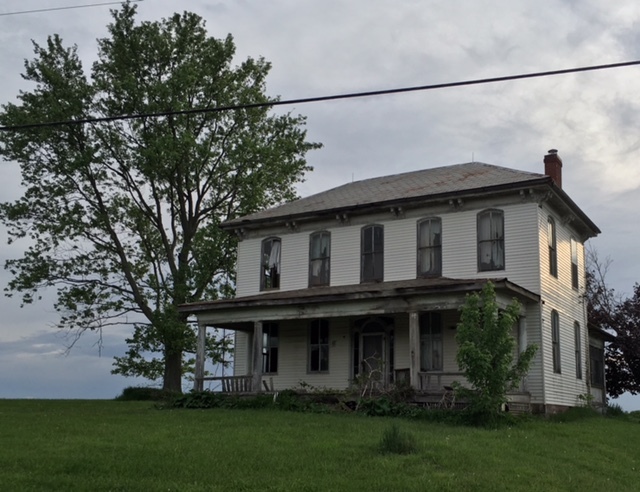 Boyer Home - c. 1867 - Winchester Road/State Route 33. Built by local farmer, Daniel Boyer (1812-1884). Married to Margaret Showalter (1816-1853) - family of 10 children. Upon Margaret's death, he married Henrietta (Giddings) Roper (1835-1903). Boyer also owned a grain elevator located near the railroad depot (behind this home). The Boyer Estate was eventually sold to Frank Phipps who also purchased Carroll Elevator (visible in second photo). In regard to Carroll Elevator, this structure was originally built/owned by Harvey J. Knisley, sold to Joseph Gundy, then acquired by Phipps. Currently, this is a rental property. (historical info and photos by June Queen, Nov., 2014). Kistler Home / 1873 - Oberle Avenue. 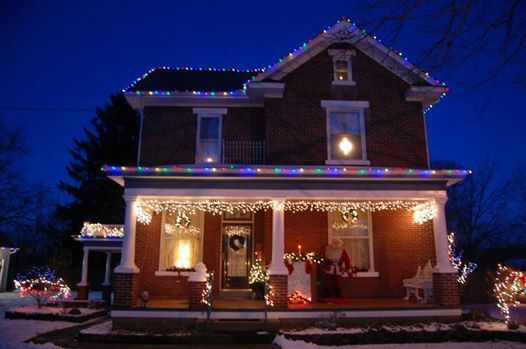 This lovely home was built by Carroll native, A.B. "Aaron" Kistler, who was a farmer, miller, and school teacher. He married Mary Ann Boyer of Canal Winchester, and they raised 9 children. The Ohio-Erie Canal once ran along the rear of this property. Remains of Canal Lock #10 still exist here today. Kistler operated a large grist mill that stood just east of this lock, however it suffered three large fires that finally resulted in its demise. This home remained in the Kistler Family until the 1970s. In 2002, Chad and Susan Brown purchased this home and proceeded with extensive restoration of both the home and summer kitchen. They lovingly preserved the original woodwork, glorious front entry-way, and other historical features. The house underwent new ownership in 2015. (historical info and photo courtesy of Chad & Susan Brown, 2014). Joshua Miller Farm - Pre-1875 - Havensport Road: This home is a familiar site to those who live in this area. It was rumored that this home was under consideration for renovation, however it remains empty and in dire need of TLC. Once a splendid farmstead that spanned over 100 acres, this home was built sometime before 1875, as it is featured in the Combination Atlas Map of Fairfield County, Ohio 1875 (see print below from this publication). This home continued to prosper as a farm until it was sold in auction over a decade ago. At time of auction, the large bank barn was sold and moved to a new location with plans for restoration. 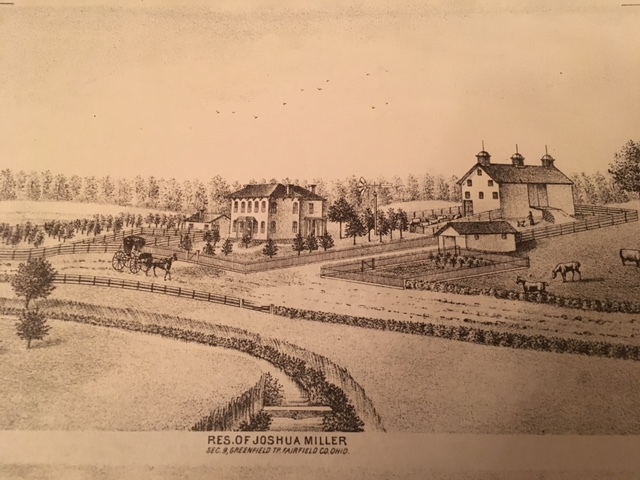 Joshua Miller (1834-1915) was a Greenfield Twp. Trustee and belonged to the Patrons of Husbandry at Carroll. 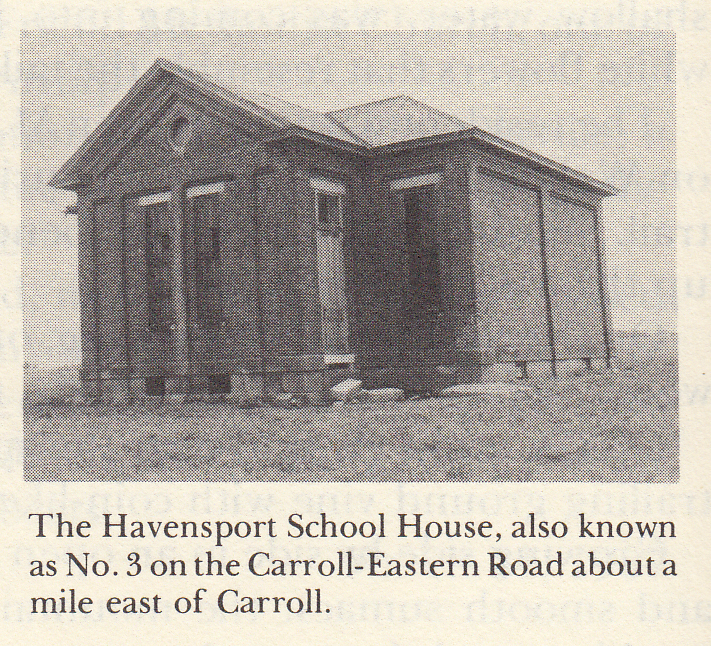 Havensport School #3 / c. 1890 - Carroll-Eastern Road/Havensport Road. Prior to this brick construction, an earlier school building (c. 1823) is said to have existed on this site and relocated. Note the two front entrances that once served as separate cloakrooms for the boys and girls. After the school closed in 1923, the building eventually fell into a state of disrepair and was used to store farm equipment. See second photo above taken prior to restoration. In 1994, the school house was rescued by Linda Jensen. After tremendous work by Linda's sons and support from her entire family, the old school house became her dream home. In later years, a two-story, log cabin was added onto the back of the school house. The log cabin was rescued from southern Ohio and dates back to the 1860s, once home for many years to Myrtle Rigsby and her 10 children! 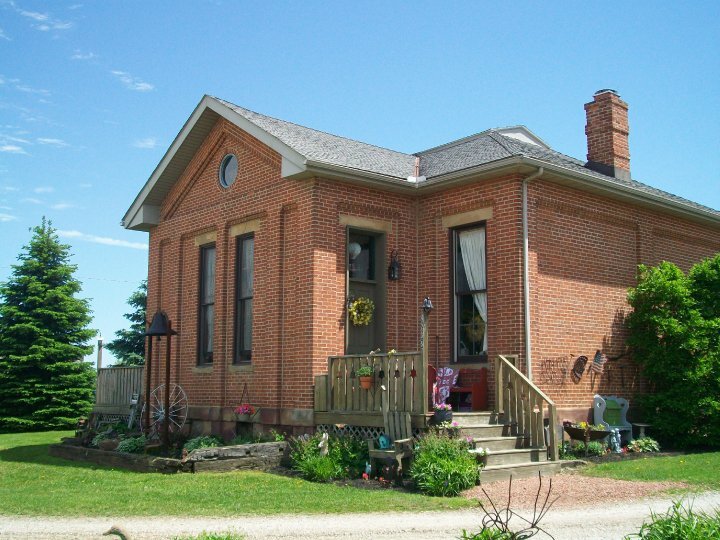 Linda happily resided in her restored school house for many years and also operated a very successful business, "Spinning Wheel Bed and Breakfast". This home is now under new ownership. (historical info and photo permission courtesy of Linda Jensen, 2010). Photo dated 1915. Front: Frank Carnes. 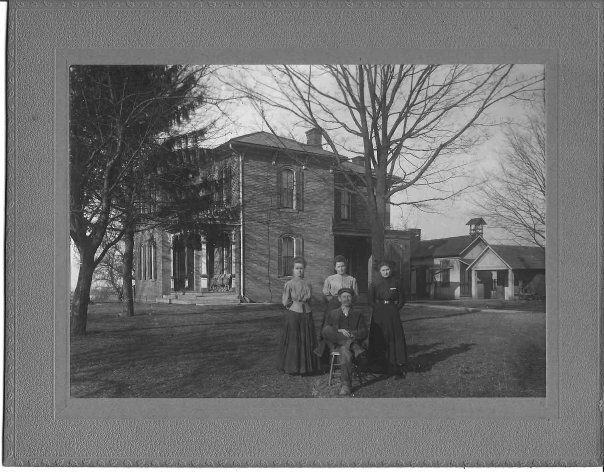 Second Row L to R: Edith Gale Carnes (daughter), Katie Carnes (wife); Mary Carnes (daughter). (photo courtesy of Keith Carnes). Carnes-Queen / 1892 - Carnes Road. Originally named Sugar Ridge Farm, this quaint farmhouse once included a large barn, smoke house, and summer kitchen on over 100 acres. It was built by Frank S. (1862-1942) and Catherine "Katie" (Wilbert) (1859-1954) Carnes. They raised four children here: Wilber, Edith Gale (Alspach), Mary (Fast-Hempleman), and their youngest, Charles, who was born in the home. Frank was a community leader and served on the Carroll School Board. His name is engraved onto the cornerstone of the 1910 Carroll High School building. In appreciation for his service, the road was renamed from Corporation Road to Carnes Road. The farm remained in the Carnes Family for over 75 years. Over time, most of the land was sold for development, including a small housing development, Carroll Knolls. The Brucklemeyer Family also resided here for many years. Don and June (Iesue) Queen purchased the home in 2006 and continue to preserve and restore its original features. (historical info and photo by June Queen, 2010). Kistler-Drobina / c. 1902 - Oberle Avenue. This stately home was built for Charles E. and Grace (Thomen) Kistler. The Ohio-Erie Canal once flowed along the back boundary of this property. Originally, the home was the country before being annexed to Carroll in the 1960s. Charlie was the son of A.B. Kistler and grew up in a home on this same street (also featured here - Kistler Home 1873). Charlie worked his way up from cashier to president of the Farmers & Citizens Bank, Carroll. He was a member of the Carroll School Board and other civic organizations. He passed away in 1970 (two weeks shy of his 100th birthday); Grace died in 1976. They resided here their entire lives and had no children. In 2001, Ed and Tammy (Clum) Drobina purchased the home to become only its third owner. Tammy is a fourth cousin to Charlie Kistler, thus the home is 'back in the family'. (historical info and photo contributed by Tammy Drobina, 2014). Holmes-Miller-Jackson / 1903 - Entrance to Carroll at State Route 33. This home was built by the Honorable James Aldred Holmes (1855-1920). A farmer by occupation, Holmes served two terms as Mayor of Carroll. Holmes and his wife, Mary (Evans) (1859-1930) raised 3 children here. It is noted that he owned 132 acres and operated a creamery in this location. When the creamery burned down, Holmes built this house on its foundation. The home was inherited by Holmes' daughter, Nellie "Clyde" (1885-1939) and husband Elmer Miller (1883-1968). It was then inherited by granddaughter, Joan (Miller) Jackson who is the current owner. Joan Jackson's daughters, Kathy and Cinda, also reside in Carroll. 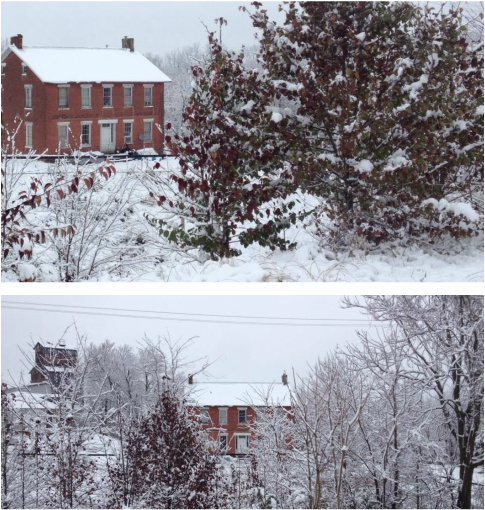 (photo permission and historical information courtesy of Kathy Jackson and Cinda Cartee, 2014).